JoJo Siwa is a former Dance Moms star, current Youtuber, mini-mogul, and hair bow designer. Needless to say, I fear her. 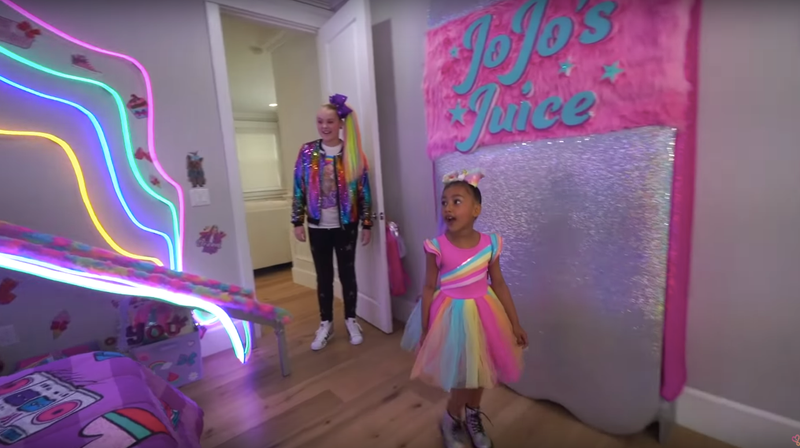 Despite the fact that Siwa is 15, her entire Lisa Frank-ified existence famously telegraphs a much younger age (that of her viewers and fans) including the fact that she lives in a glitter-dusted mansion filled with photos and merchandise of herself. Siwa posted a new video yesterday in which she “babysits” North West. They make slime, they play hide-and-seek, and at one point Siwa opens up a claw machine in her house and lets North West have at the toys inside, because 1) it’s North West and 2) what even is money, right? It’s a miracle I even remember they did all that considering I spent the video distracted by Siwa’s home, which was not unlike a suburban Claire’s store. Siwa has showed off her house before in videos, but the tour with North West really draws out how weird the place is, mainly that the house is designed to appeal to a 5-year-old. And when you walk into her home, mannequins wearing Siwa outfits greet you at the door. Do they come alive at night to murder trespassers? Who’s to say! And she has what appears to be a professional nacho machine in her kitchen, which is covered in candy decorations. If only we were all so lucky. Of course, North West loves all of it, but I’m stuck wondering how much of this is for show. When Siwa sleeps at night does she really sleep on a bed of unicorn stuffed animals? How many surfaces in this house are plastered with her face? Wearing one bow looks like it hurts, so is wearing two JoJo Siwa bows for daredevils only? These are the questions that will keep me up at night. Does Jojo Siwa Get Ariana Grande-Level Ponytail Headaches?